UDM Downloads > Web Content Grabber! Here is what Web Grabber is helping our customer do.- Produce highly effective direct marketing campaigns: Grab your list then print your Mailing Labels right from the tool. Grab your list then print envelopes from Microsoft Word or Grab your list and E-Mail your letter directly from the tool. Generate Sales Leads fast for telemarketing campaigns. Research your competition - find out who is selling similar products fast. Collect data, build databases and sell them to clients. Want to market your product or service to new clients locally, nationally or internationally? Tired of manually building client lists? Want a tool to automate you data collection? Congratulations, you are at the correct site. 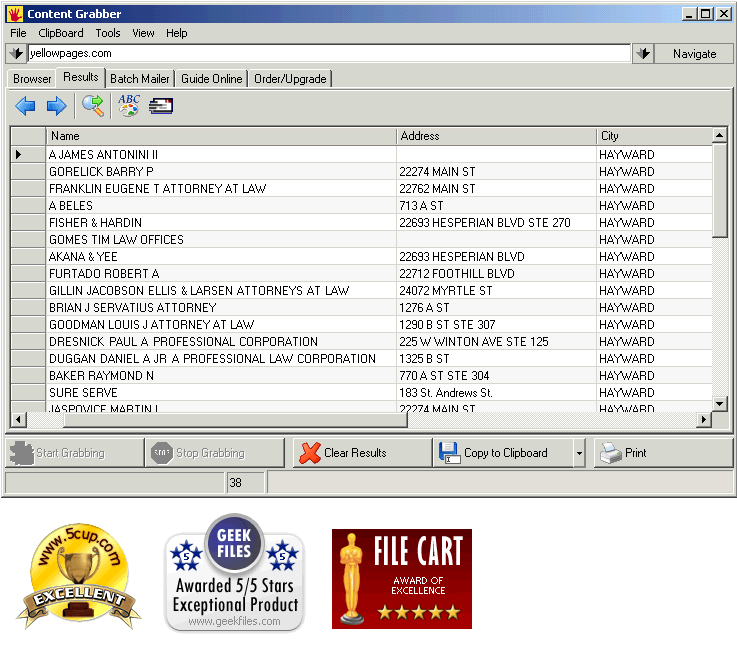 Whatever your business - if you are looking for a fast and effective way to captures names, addresses, phone numbers and other contact details from websites, e-mail or other desktop applications, Web Content Grabber is the tool for you. Capture sales, marketing and businesses leads and email signatures then export them into your contact management software in five effortless steps using Web Content Grabber. Effortlessly turn your database into mailing labels or marketing e-mails. Export your data to tab, comma-delimited (*.CSV) formats as well as XML for use in other software programs or on your website. WCG is now intergrated with Google maps.